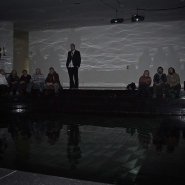 Basen (Pool) is an interactive installation, which uses the space of the performers pool, at the main hall in the Centre of Contemporary Art in Toruń. 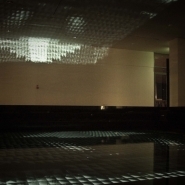 The mechanism of the installation, is based on the visualization of sounds, that are gathered from around the pool. The sound of steps, people talking, all the noises that are common to the environment, are having an influence on the shape of animation, that is seen on the bottom of the pool. 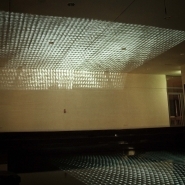 The picture is provided by two projectors placed aside each other. Both generating the same image, in mirror effect. 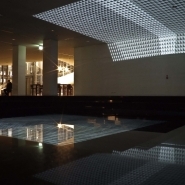 Thanks to the ten centimeters high layer of water on the bottom of the pool, I gained additional effect of reflection on the wall and ceiling, at the opposite side of the pool. Yet, every disturbance of the water surface, has an influence on the shape of that particular reflection. To achieve the specific esthetic feeling, I’ve used over forty animations of my design, and a software tool, that is capable of steering the animation flow, according to the volume level of sound, and it’s bandwidth. 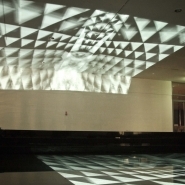 The animations are, by the conception, geometric black & white compositions, which in form, correspond with the specific architecture at place. 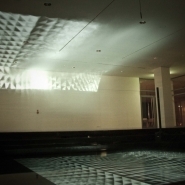 While there is quiet around the installation, on the bottom of the pool you can see a homogeneous composition, of black & white triangles. When sound appears, picture starts to change, triangles move, the composition modifies and loses its integrity, becomes more dynamic. The installation has been first shown on November 2008, in the Centre of Contemporary Art, to be my graduation work, and was exhibited till the end of the year.